Welcome to GenoPro Family Trees! GenoPro offers a free service for publishing genealogy online. If you are looking to publish your family tree and pictures on the web, but are somewhat confused about how to get started, GenoPro offers you an easy solution. With a few clicks of the mouse, you can publish your complete family tree to our server familytrees.genopro.com. This feature is built-in to GenoPro's report generator. When generating an HTML report, select the option to publish your report to our server instead on your local drive or website. GenoPro will upload your HTML pages, family tree and pictures to your account on our server. It's free! You are not required to own a website or to pay a subscription for web hosting in order to host your HTML pages. We already own the infrastructure to host all your pages. It's easy to use! It only takes a few mouse clicks and a few keystrokes to get on your way. No prior web hosting knowledge is required to make it work. For those who wish to publish on their own web server, you are welcome to read our technical documentation to configure your web server. It's fast! Our built-in publisher protocol uses compression and other advanced caching techniques, making it faster to publish with us than publishing via FTP. It's ad-free! We do not plan to insert any advertising either. Rather, we hope you will create links to our site, bringing us more visitors who may become fellow GenoPro customers. It's a reliable backup! Each report contains a copy of your family tree. If your hard disk crashes, you can recover by re-downloading your family tree from our server. There is no quota! There is no limit on the number of pages and pictures, as long as your published content is related to genealogy and is web-friendly. You may become a genealogy addict using our software. You are welcome to publish as many pages as you wish, provided the content is related to genealogy and is web-friendly. In other words, don't upload a 20-MB true-color bitmap while you can store the same picture in the JPEG format for only 200 KB. If you have a [large] family tree having one million individuals and thousand of pictures, you are welcome to publish it to http://familytrees.genopro.com/. In fact, we will be happy to assist you by optimizing the report generator and our web publisher protocol to handle such large trees. Try to keep pictures to less than 300 KB so they are easy to download by our visitors. In the future, we will write a tool (robot) to scan the published reports to send an email message if a picture is too large and/or automatically re-sample (shrink) the picture. If you upload files containing applications, games or other non-genealogy content, we will disable your account. We do not plan to police the content of your family report, however if we receive complaints of abuse, we will examine each complaint on a case-by-case basis. 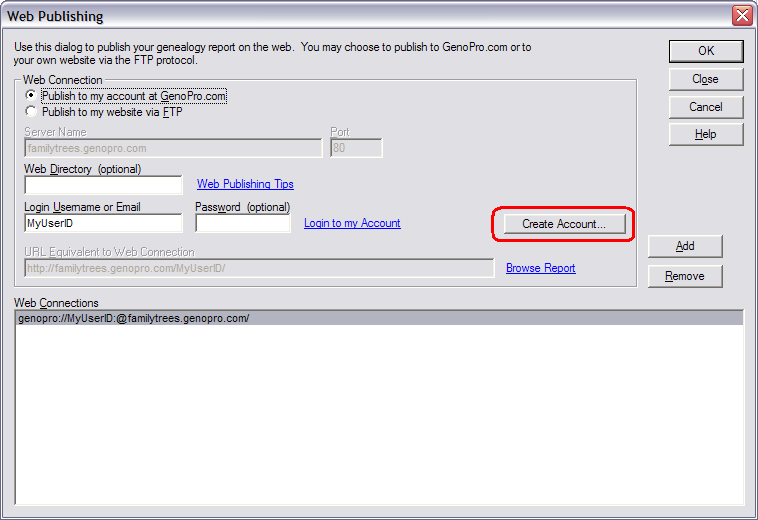 Publishing your genealogy report to http://familytrees.genopro.com/ is done via the report generator. To invoke the report generator, click on the Generate Report toolbar icon to get the following dialog. Request a free 14-day evaluation key. Click on the button Create Account and/or Send Password. Creating an account is easy. Enter your email and optionally your username. If you do not provide a username, we will generate a unique number as your username. If your email is already in our database, we will send your password by email without changing anything to your account. At anytime, you can change your username or email in the control panel of the support forum. The report generator uses your username to create a unique URL for your family tree on the web. For instance, if you pick MrSpock as your username, then your genealogy report homepage will appear at http://familytrees.genopro.com/MrSpock/. GenoPro may use some username for specific genealogy trees, such as Harry Potter ( http://familytrees.genopro.com/harry-potter/ ). That's it. Click on the Generate button and GenoPro will do the rest of the work for you. To view, edit or delete your reports, use the control panel of the support forum. 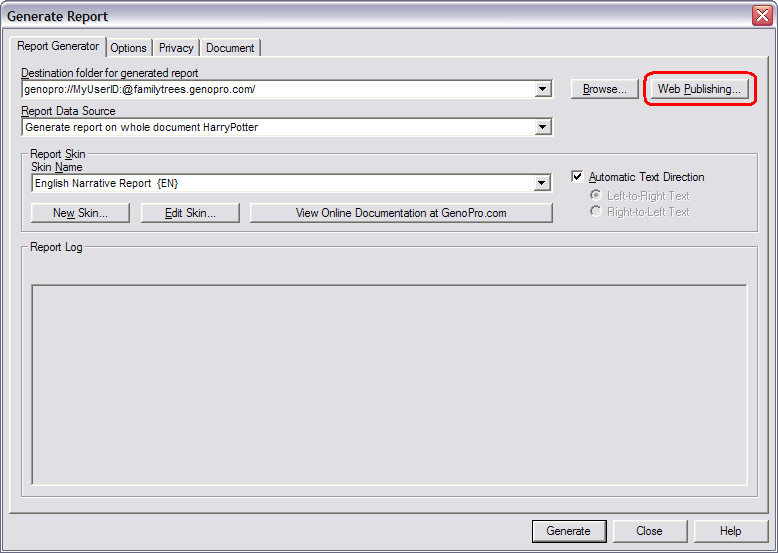 GenoPro offers many options for generating a report. For instance, you may generate your report on your hard drive or on your own web server. If you choose to generate a report on your own hard drive, click on the Browse button and pick the folder you want to store your report. There are other options, such as the data source. By default, GenoPro generates a report on the entire family tree, however you may want to generate a report for a specific sub-tree (named GenoMap). Use the Privacy options to exclude sensitive information from your report. Sensitive information may include date of birth, contact information and some special comments. More documentation is under way... If you have questions, suggestions or problems, you are welcome to post your comments to our support forum.